We are experiencing the hottest Spring on record in the U.K. While we all want to make the most of it, we must be aware that when the weather heats up, the chances of being bitten by a tick increases as well. Many of us are all too familiar with tick bite prevention methods which is so positive but sometimes educating others is more difficult as they may believe that Lyme disease ‘will never happen to them’ and that a tick bite is no big deal. 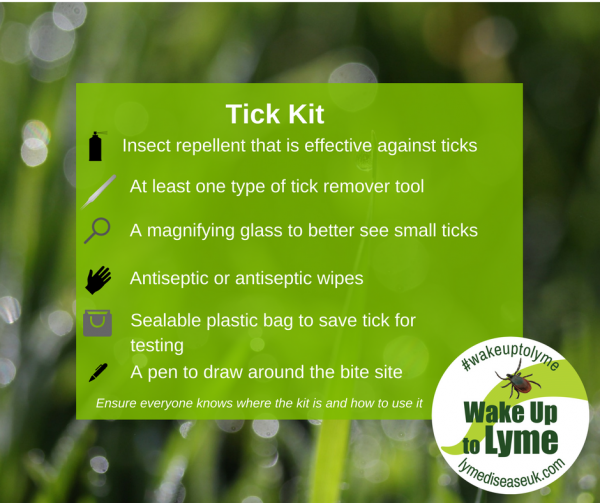 We never want to come across as a nag but we do have a duty of care to educate other people as much as they will allow us to when it comes to tick bite prevention methods. Wear long pants and long-sleeve shirts when in the outdoors. Make your yard unfriendly to ticks by clearing wooded areas, keeping underbrush to a minimum, and putting woodpiles in areas with lots of sun. Be vigilant. Check your children, pets, and yourself for ticks. Don’t assume you can’t be infected again; people can get Lyme disease more than once. Remove ticks using one of the correct techniques and alert your doctor if you experience a rash or feel unwell following a tick bite.